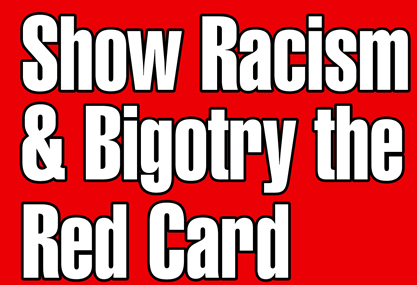 As part of our SPL Trust funded initiative targeting young people in grass roots football throughout Scotland, Show Racism/Bigotry the Red Card will deliver its second event in Edinburgh on Tuesday 9th August. The club will involve their full under-15s squad in this initiative aiming to promote an overall message of equality and respect. The event features a combined workshop exploring the causes and effects of racism and sectarianism, this followed by a question and answer session with Hibs and Rangers legends Michael Weir and Derek Ferguson. Additionally, our dedicated Red Card coaches Michael and Derek will be offering to the young players a fun football coaching session. John Blaney, the long serving club’s Chairman, said: "Edina Hibs as a club are unwavering in our belief that racism, sectarianism and all other forms of discrimination should be stamped out to allow our game to continue flourishing. Football is a game to be enjoyed by everyone regardless of creed, race or colour"
Elio Ajmone, Project Manager for Show Bigotry the Red Card, said: “This initiative is a great way of engaging young people with our anti-racist / anti-sectarian message and equipping them to deal with racist / sectarian attitudes and behaviours. Our intent is to provide an experience that is both fun and thought-provoking”. Billy Singh General Manager of the Scottish Premier League Trust stated: “The SPL Trust is delighted to be able to financially support this initiative. It is important that we come together to tackle all forms of intolerance. This initiative’s focus on tackling sectarianism and bigotry through young people is particularly timely”.